Stand up paddle boarding and yoga have combined for a unique experience. If you are interested in SUP Yoga, it’s best to have a board that assists with balance rather than one that’s built for speed. 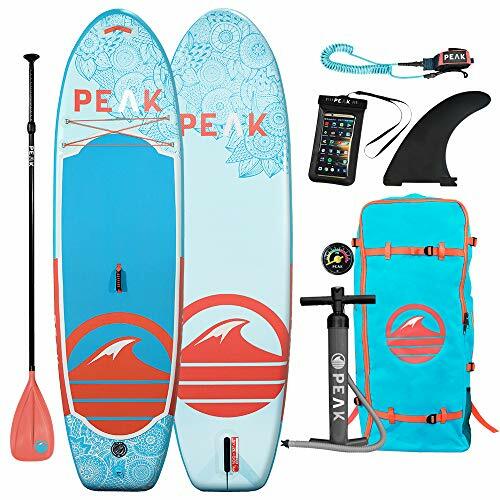 When choosing the best paddle board for yoga, you’ll need to consider your skill level as well as your transportation situation. 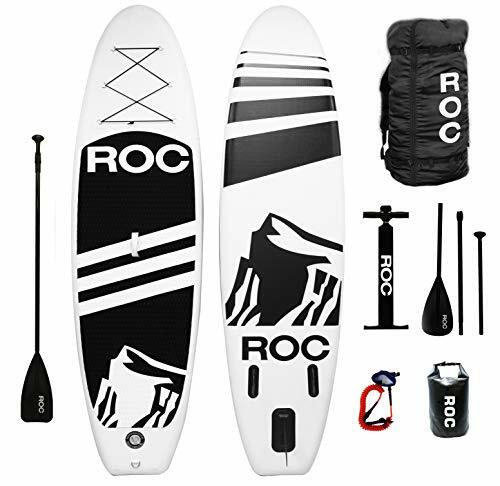 We enjoy using an inflatable board since they’re softer than a solid board, and their compact design makes it easy to take anywhere. There are boards designed specifically for yoga. They are typically a wider board of medium length to provide stability. However, any “all-around” boards with these dimensions will perform exactly the same as a yoga specific board. Here are some of our top choices. 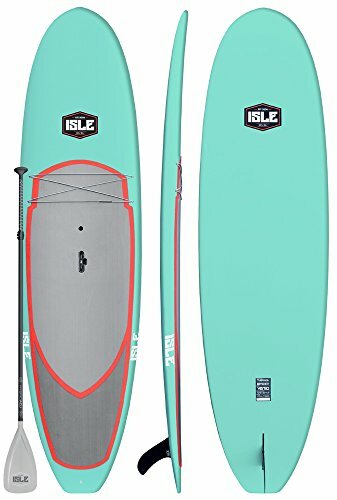 Scroll down or click here for a more complete list of the best yoga SUP boards. Yoga is an activity centered on improving health. Whether you want to focus on flexibility, relaxing with your breath, or having an intense workout, it’s all possible on the water. Typically, yoga paddle boarding occurs on calm water, like a lake. You can always practice in a pool to build up any strength or flexibility you feel you are lacking. Many yoga poses incorporate balance, so having the right type of paddle board is crucial to take your yoga to the next level. Because you will be on your hands and knees and may take a fall or two in the beginning, we encourage you to find a board with a softer, more forgiving surface. SUP yoga embraces many traditional poses while working your balance muscles even more than dry land yoga. By changing your yoga routine up, you become more mindful of your movements, all with the fun and adventure of paddle boarding. Is It Hard? Can I Do It? First and foremost, YES! SUP yoga is an activity that everyone can do. From beginners to experienced yoga practitioners, SUP yoga is both doable and beneficial. Now, we won’t lie, doing yoga on a paddle board is a little trickier than doing it on the flat ground. But with the right tips and a good board, you’ll impress yourself with your newfound skills. Mindfulness – You become aware of every movement in your body and how it affects your progress on the board. Staying in the Present – Living in the now is easy when you are floating in the water and trying to balance. Any shift in thoughts and you are going to get wet. Great for Beginners – The simple poses are some of the best to do on a board. You don’t need to worry about complicated positions, just start at your level. Slows You Down – You may be in the habit of moving quickly through your yoga routine. Balancing on a board forces you to slow your movements down and focus on your breath and body. Challenges Advanced Students – If you’re already a yoga guru, changing your practice to a paddle board will open up new areas to focus and encourage further awareness by taking you out of your everyday routine. Enhance Your Muscles – Breathing and focusing your body lets you hold those yoga poses. Now add water and notice how those same muscles (and maybe some new ones) work to adjust to reach an equal balance. SUP yoga targets the core area and works to strengthen the rest of your muscles by giving that extra edge. Unique Experience – The wind, weather, and water conditions are never the same as a previous practice, so you will always have a one-of-a-kind practice. Hot Yoga with a Cool Down – Practicing outside in the summer will get you sweating like those hot yoga classes. But when finished, you get to jump into the refreshing water. A hard workout with instant reward. Enjoy the Outdoors – Combine yoga and nature to reconnect with yourself and your surroundings. Just make sure to focus on your breathing with all the breathtaking views you see when you practice. Challenging and Fun – We like to push our limits while doing something enjoyable. Yoga on a paddle board offers the unique experience that will have you coming back for more. You Time – Doing yoga while floating on a lake makes it very difficult for others to bother you. It’s just you, the board, and nature. You get to experience the “me time” that yoga provides. Forgivable Slips – While going through transitions or working on a balancing pose, we all have slips. Instead of hitting the hard floor, a refreshing dip awaits you. And perhaps it was the cool off you needed. Keeps a Beginner’s Mindset – No matter your level, by transferring your yoga to paddle board, there are new experiences that will engage your mind and body. Keeping things fresh is healthy for your brain and makes your workout more exciting. 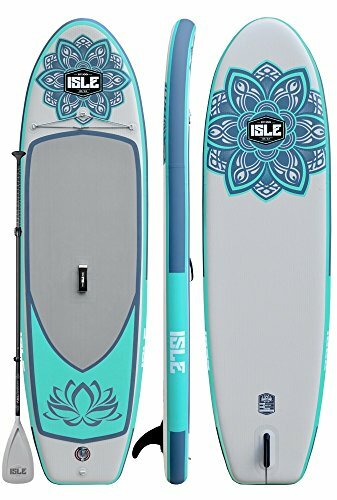 How Do I Choose a SUP Yoga Board? 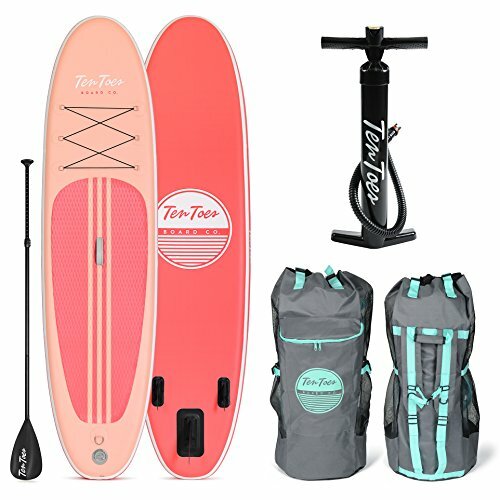 When looking for the right SUP yoga board, you’ll find there are already yoga specific paddle boards out there. However, if you keep a few considerations in mind, any all-around boards is a perfect paddle board for yoga. The thicker the board, the more weight it can handle. If you are tall or heavier, a thicker board may work better for you. A thick board will also keep you further out of the water if you don’t want splashes during your poses. You also want to make sure you have a wide board. The wider the board, the more stability you have. And the more room you have for your yoga poses. Wider boards tend to be slower, but you are looking for a SUP primarily for yoga, speed shouldn’t be an issue. It is still possible to do yoga on a narrow board it just increases the challenge. Aim for a board that is at least 32 inches or wider. 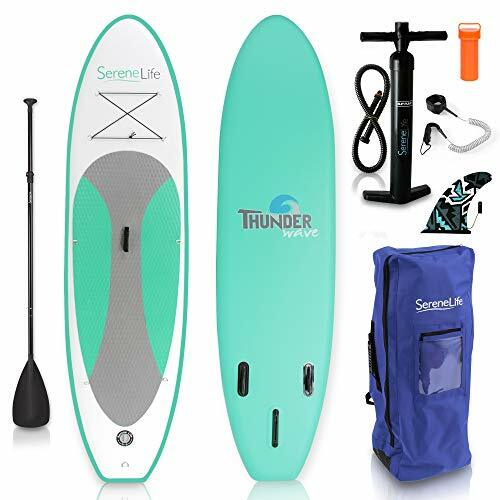 The length of a SUP contributes to speed and maneuverability and don’t play much of a part in yoga, but if you want a versatile board for other activities, you can pick the right length for you. See our guide for advice on board length. 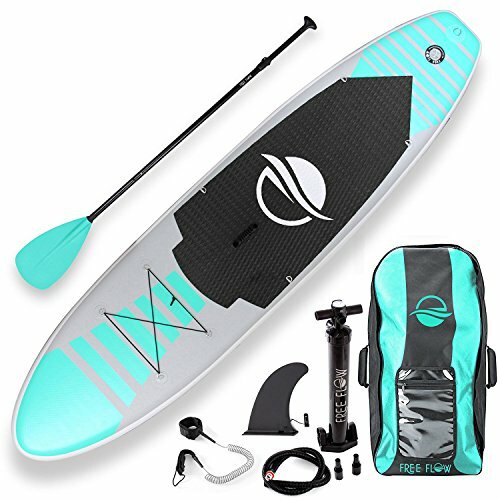 A yoga paddle board will have a nice, foamy soft top that covers most of the deck. If you find a board that doesn’t, no biggie, traction padding can be purchased separately and easily applied yourself. Holding poses will be more comfortable with the extra padding. Type of Board – iSUP or Solid Core? 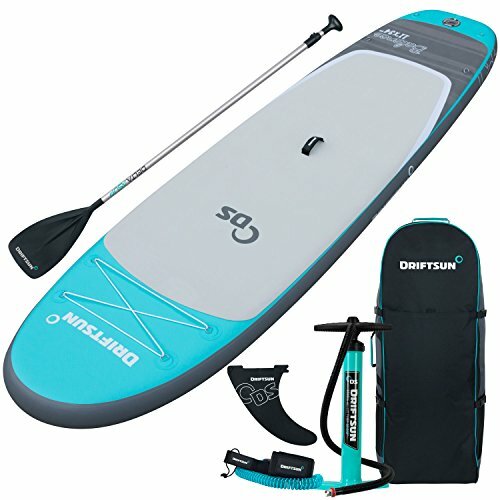 An inflatable SUP (iSUP) is an excellent option. iSUPs offer more cushion and, just like your yoga mat, they compress into a medium-sized duffel bag for efficient travel. Solid core SUPs offer quality stability, which can be very helpful for yogis. But, keep in mind these boards do not fold up. You’ll have to have the storage space and a vehicle that can transport the board. AIRTECH CONSTRUCTION - 10' x 32" x 6" | Board Weight 20 lbs. | Support riders up to 240 lbs. VIRTUALLY INDESTRUCTIBLE - Constructed out of incredibly tough military grade drop stitch PVC using MLS technology | 6" Thick | No more dings or cracks with this ultra durable board. Besides the board, SUP yoga has some other equipment that will enhance your experience and make sure that safety is a priority. Of course, with a paddle board, you will need a paddle. Any SUP paddle will be sufficient. When choosing your paddle, make sure it is fitted and sized correctly for your body. While doing your SUP yoga, we recommend laying your paddle perpendicular to your board up near the nose. Or, if you want to have it float in the water without it floating away, a coil leash can be wrapped around. 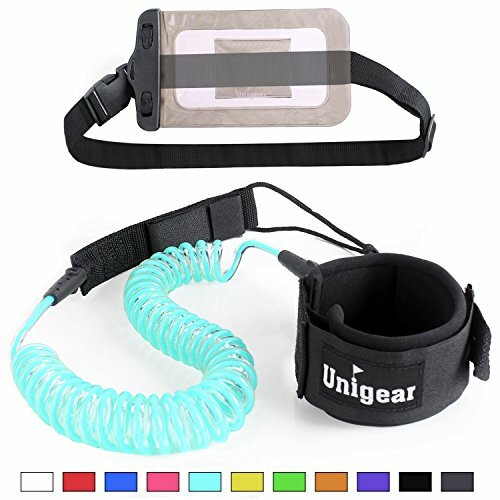 A non-coil leash can also be used by securely binding the hook-and-loop strap to the shaft. 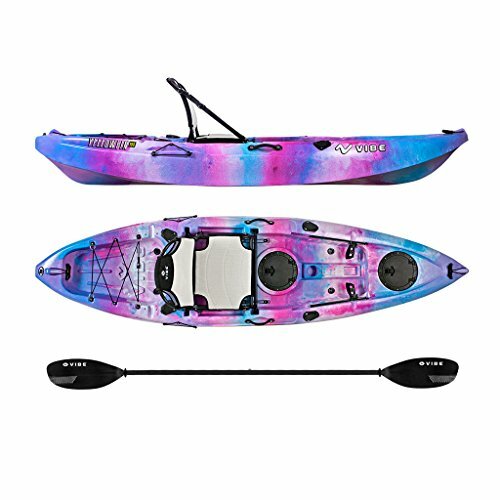 Having the paddle attached in the water keeps it out of your way and out of mind. A leash is a wonderful tool to keep you and your board close if you should fall off. 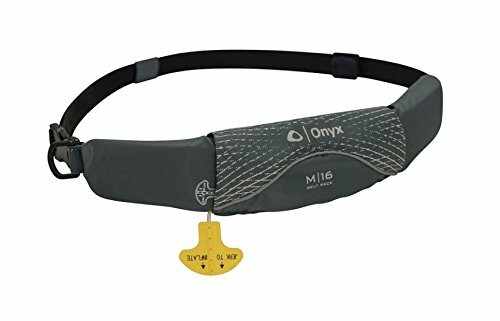 Leashes Velcro attach around your ankle and stay connected directly to your SUP. We think it is best to use the leash when paddling to and from the shore but agree it’s all right to remove once you are anchored. You won’t want to get tangled up while practicing yoga. However, if you don’t use an anchor, keep the leash on so you won’t lose your board. It shouldn’t give you too much trouble during poses. Anchoring your board isn’t necessary for SUP yoga, but you might find it distracting to drift from one area to another while practicing. Anchors are also helpful if you are doing yoga with a group. 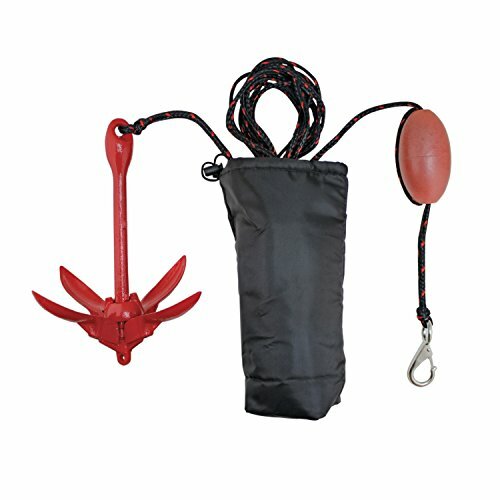 A kayak anchor works well for SUPs. Attach the end of the anchor rope to the area of your board were your leash attaches. Keep everything on the board as you paddle out to your location and then lower the anchor. Once the anchor hits bottom (aim for 10 or 15 feet deep water), let a couple more feet out of the rope. 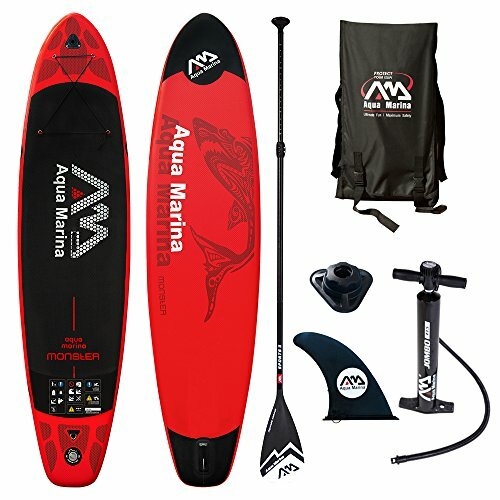 Any excess line you have can be tied off at the leash attachment point and then stored on the tail of your board while you float. We encourage you to bring an emergency whistle along anytime you go out on your board. If you are in distress and need to signal for help, this is an easy and efficient way to do so. Depending on where you SUP – like the open ocean, an emergency whistle may be required by law. Different states have different requirements on personal flotation devices, but it’s always helpful to have one available. Even if you don’t wear it during your yoga practice, having a PFD on board can offer you peace of mind. We encourage a natural seated pose to start you off. We also find it useful to orient yourself around the handle of your board because that tends to be the board’s center of balance. As you transition through poses, try keeping your gaze fixed on an unmoving object on the horizon. Shifting your eyes quickly and often can contribute to loss of balance. Find a point to help stabilize you. Yoga poses that only have one point of contact are very challenging for a paddle board. We like to have two points of contact at all time. It allows you to focus on keeping your body aligned without compromising stability. Wider stances are also helpful. We also recommend going slow. Do your routine at half the speed and allow for rests while you keep your breathing relaxed and even. If you’ve never been on a stand up paddle board, we suggest giving the regular experience a try before jumping straight to yoga. Take lessons with a local instructor and tag along with an experienced friend. Having the confidence to use a SUP board will make you more comfortable when it comes time for SUP yoga. Invite some friends, and you can create a whole SUP yoga class. Beginners and advanced students alike will enjoy SUP yoga. There are many physical and mental health benefits, plus the adventure involved. Stay aware of your yoga and find the right board. Bring some friends or enjoy your alone time as you find your inner balance and your outer balance on the water.